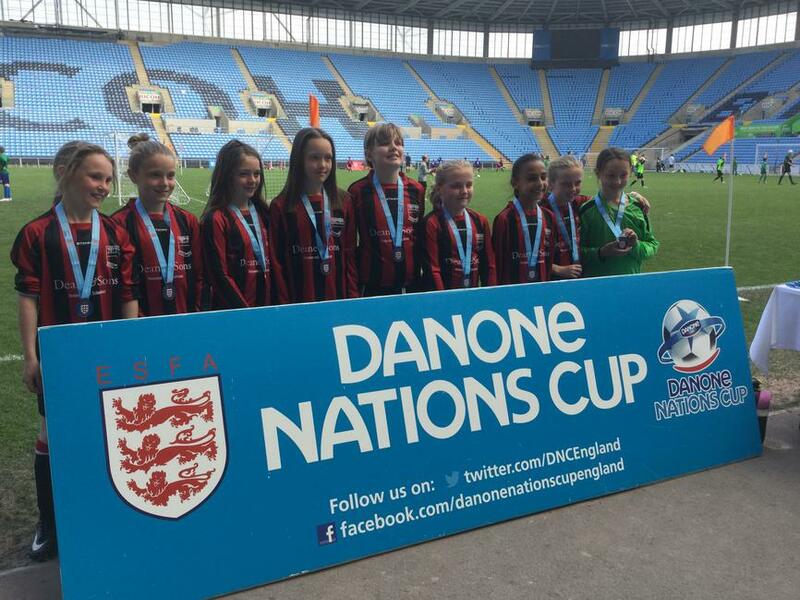 The combined year five and six girls' football team travelled to Coventry this Saturday to represent school in the Danone Nations Cup. It has been a long journey for the team and they have consistently well to get this far in the cup. A bright sunny morning , the team travelled by mini bus , in a convoy with parents to Coventry. Arriving at the impressive stadium , everyone was allocated a wrist band and as a group of players and supporters we set up camp in the stand. The girls were disappointed that captain Edie P was poorly on the day as she has been a very influential part of the team. Maddie D who played with great skill and leadership took over the role of captain. The team played in pool A against three other schools. The kick off was delayed , which was a shame as it was hot . However , despite the setbacks , the team got off to a good start with 0-0 draw against Gerrards Cross C of E School. Aida R took over the Goalkeeper shirt and showed great skill in defending. Cerys W played very well in this match despite discomfort from a previous injury. After some great advice from parent, Mr. Saxon the team went onto play even better in their second match against St. Bernard's Catholic Primary School . An early goal from striker , Katie R meant the team spirit and standard lifted. Olivia F and Katie H followed the ball with determined tenacity even though the sun was hot. Ella S marked beautifully in defence. Anika B played with spirit and determination and Ella H showed great potential in midfield . The other team scored a late equaliser in the second half. After two matches the girls were in a good position in their pool. The third and final match against Ponteland Academy was challenging.The opposition was strong and scored early. 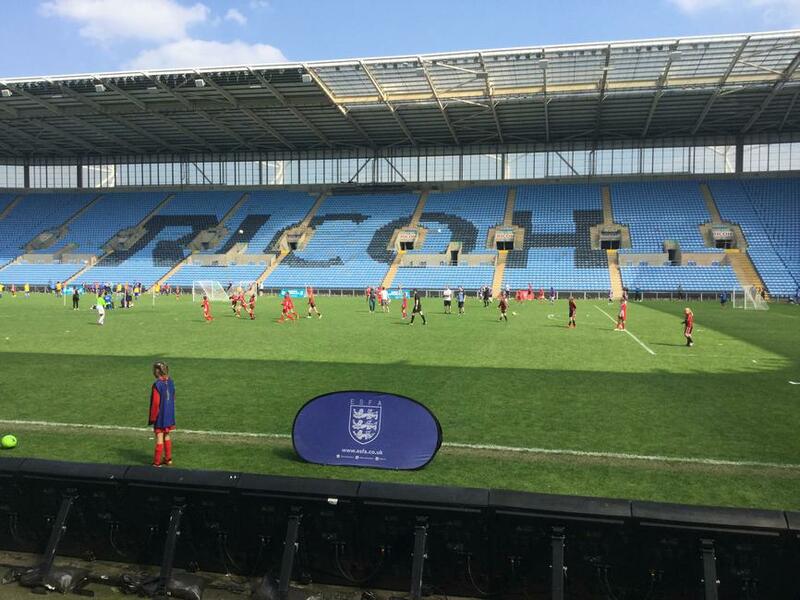 Our girls showed their fighting spirit and didn't give up despite finally losing this qualifying game3-0. This meant that today , the team did not make the semi- finals stage. In true football tradition the team lined up in the tunnel and were each given a medal for reaching the Nationals. A very memorable day. 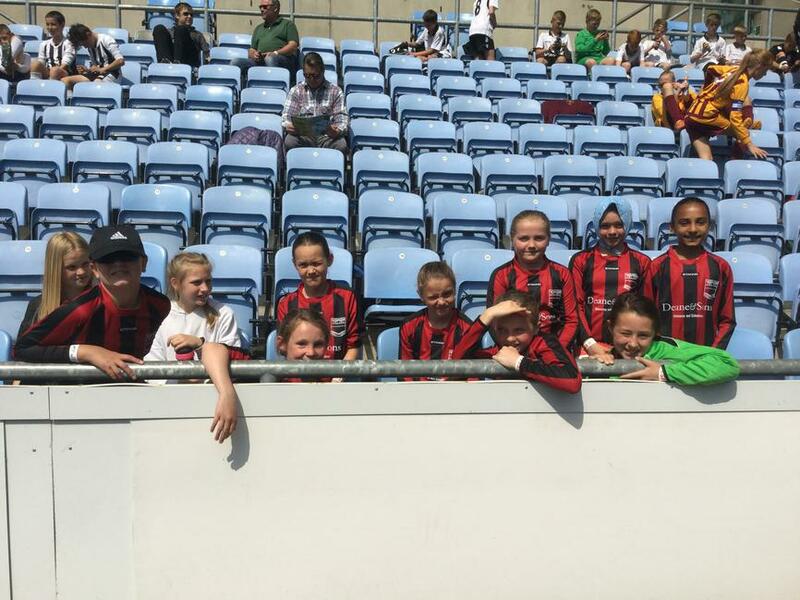 A first for the girls from Hugh Sexey and exciting potential for the future of girls' football. Well done indeed for getting so far in this prestigious cup. Many thanks to coaches, Mr. Lamb and Mr. Waterfield and to all the families for their dedicated support. But without the girls' skill, hard work and enthusiasm it wouldn't have happened.